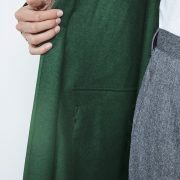 This long overcoat (grey exterior, green interior) comes in double-faced wool woven in Italy. Its classic collar, sleeve tightening flaps and gusset pocket flaps have a raw edge finish. It has a zipper and hidden press stud closing system. It’s chest tailor pockets and large hollow fold at the back give your silhouette a casual chic allure. 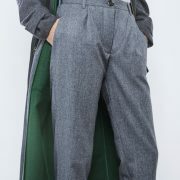 The long belt allows you to adjust the overall volume, as you like. 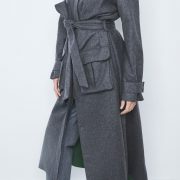 The body of the overcoat is lined with braiding and will keep you warm all winter.